The Reverend Dr. Georgia Green Cagle Frye was born June 16, 1931 in the Moore County Hospital, to the late Emma Wilson and George W. Cagle. Georgia passed away peacefully on Monday, May 7, 2018 at Peak Resources (Pinelake Nursing Home) in Carthage, NC. Georgia’s early Christian training began at St. Augustine AME Zion Church in Carthage, NC. She later joined Mount Zion AME Zion Church in Carthage. Georgia began her early education at Pinckney High School in Carthage. She then attended A&T University in Greensboro, NC where she received her Bachelor’s Degree in Education and later earned her Master’s Degree in Education. After teaching in Moore County school system for over 30 years, Georgia acknowledged and accepted the call to preach. 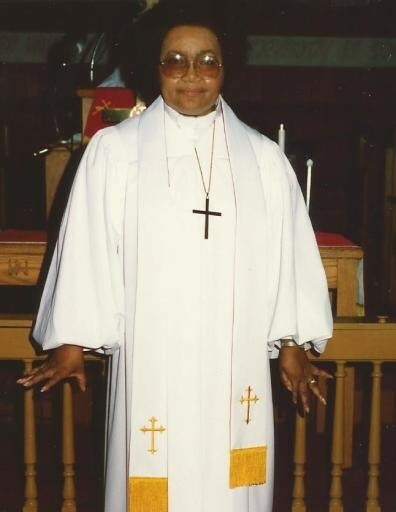 Georgia prepared herself for ministry by earning her Masters of Divinity Degree at Shaw University in Raleigh, NC. She then attended Drew University in Madison, NJ, earning her Doctorate of Ministry. Georgia pastored in the African Methodist Episcopal Zion Church, two charges, Jordan Chapel AME Zion and New Zion AME Zion Churches in the Sanford District. Afterward, she preached for several years at Ingram Presbyterian Church in Carthage, NC. In 1978, Georgia met and married the late James Edgar Frye. Edgar was the love of her life. He was her protector and best friend. Georgia leaves to cherish her memories, one nephew Jethro Matthews (Mary), and her devoted first cousin and caregiver Randy Shepard, of the home. Others left to cherish many beautiful memories of Georgia are a host of beloved cousins who were dear to her heart.